On Thursday, June 10th, in one of the most anticipated annual events at The FCI, students, faculty, staff, and visitors came together to witness and judge the series of competitions that makes up 3rd Annual Concours de Chiens Chaud. The second floor classroom, familiar to most students as the site of orientation, HAACP lectures, and wine tastings, was the location of the Beverage Competition. 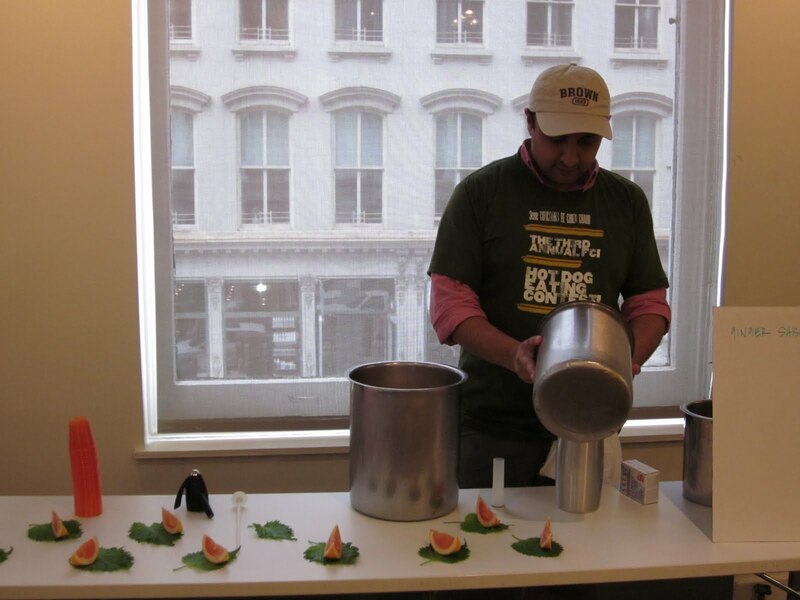 This "battle for the blender," termed such by Friends of The FCI president Andy Bersh, gave current students an opportunity to try their hand at (non-alcoholic) mixology. 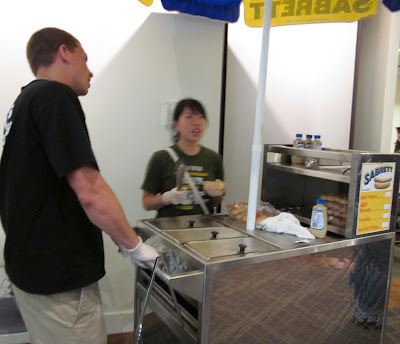 The challenge was to concoct a beverage to accompany a hot dog, and on hand to help tasters get in the mood was a cart of complimentary hot dogs courtesy of Sabrett. Those who wished to sample the drinks and vote could purchase a pack of stickers (appropriately stamped with a picture of a hot dog), which they could affix to the poster accompanying their favorite beverage. Students from across all levels of pastry and culinary entered the competition, and the concoctions varied from sweet to tart to sparkling to blended. Mihir Desai, a Level Six Culinary student, came up with Ginger-Shiso-Grapefruit-ade ("because I feel like shiso is underappreciated!"). Mihir, who grew up vegetarian, says he has eaten about a half a hot dog in his life, but he thinks his drink would pair nicely with a lamb burger. The taste of the shiso did come through nicely in the drink and was a nice pairing with the sour grapefruit. Nick Lama and Glenn Cinguina, also Level Six Culinary students, teamed up to enter the beverage and the condiment competition. 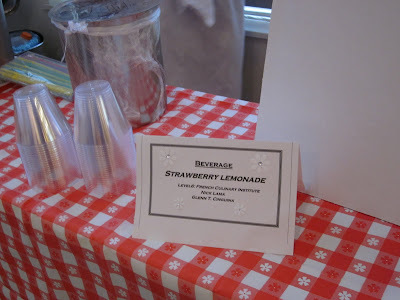 Their entry in the beverage portion was a strawberry-mint lemonade, which paid tribute to a drink that Nick’s family made during his childhood. They steeped the mint leaves before infusing them into the strawberries and lemons. From Level Three Culinary student TJ Kim, we got Green Splash, a colorful drink that blended everything green to evoke the idea of summer. He included ginger ale, lime juice, mint, and green tea. TJ suggested the drink might pair well with an alcohol such as Pimm's—yum! 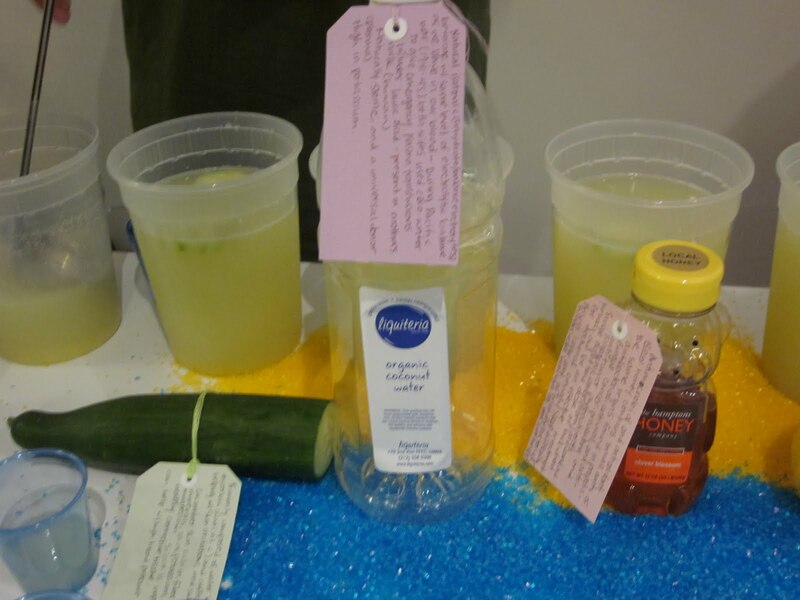 Maxxe Sternbaum, a Level Two Culinary student, put a lot of thought into her drink entry: Summer Lemonut. 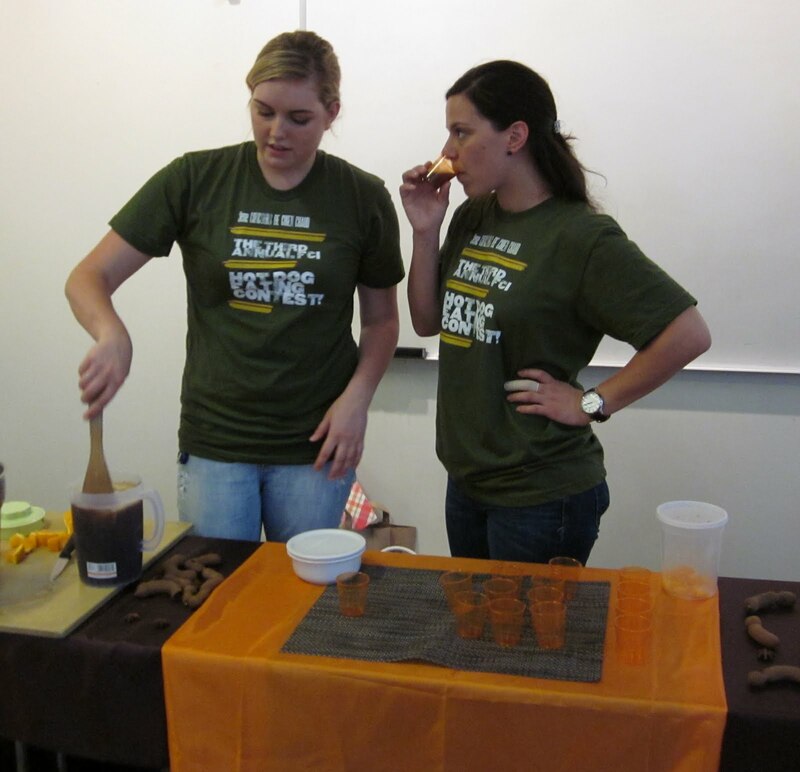 She eagerly explained the benefits of each ingredient to tasters. She chose lemon for its alkalizing properties, honey for its antioxidants, coconut water because it's isotonic and contains electrolytes, and cucumbers because they contain high levels of magnesium. 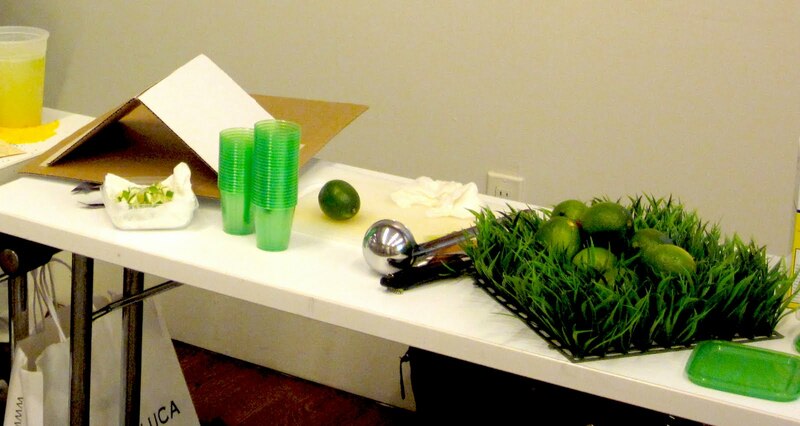 Her idea was to create a thin, cold, fresh drink that could add some nutrition to a hot dog meal. Good thinking! Orange-Tamarind Fizz, the entry from Jessica Young, Level Six Culinary, (on left in photo) had a nice spicy flavor. 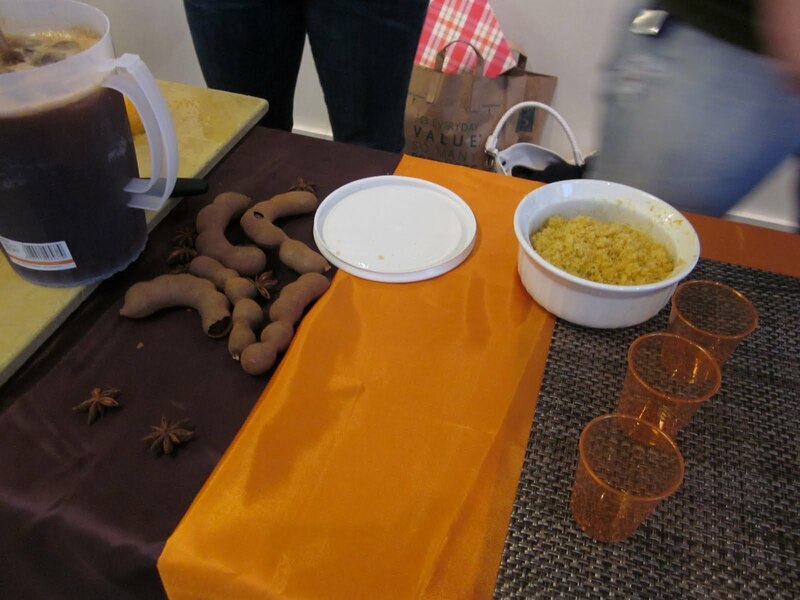 Jessica said she chose the ingredient combination to pair with her entry in the condiment competition, a tamarind concentrate sauce. 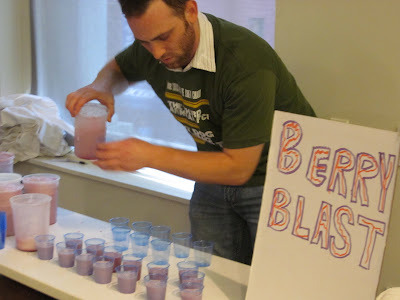 As voters walked around and sampled the drinks towards the end of voting, it looked like it would come down to the Tamarind Fizz and the Berry Blast—both entries' posters were filled with hot dog stickers, and the candidates were running low on samples. Back in the auditorium, the votes and donations were tallied. More than $300 worth of ticket sales from the competition went toward scholarships for financially in-need FCI students! TJ Kim's Green Splash came in third place. With just one more vote, second place went to Jessica Young's Orange-Tamarind Fizz. And the winner, recipient of a Vitamix Vita Prep 3 (worth over $1,000!) was Jeff Weiss with his Berry Blast. *Click here to watch our video interviews with more of the competitors.